Emblem of Liwa al-Mukhtar al-Thiqfi. Flanked by the flags of Syria and Iran, the top reads: “Fawj Qamr Bani Hashim.” The centre consists of a flag with the inscription: “Labbayk ya Hussein.” At the bottom is the name Liwa al-Mukhtar al-Thiqfi. The rise of ‘Syrian Hezbollah’ is by now a well-established aspect of the conflict, as multiple Syrian militias have arisen that have a clear and direct affiliation with Lebanon’s Hezbollah, such as Quwat al-Ridha based in the Homs area. Other militias, such as Liwa al-Imam Zain al-Abidin, whose secretary general was recently killed in fighting in Deir az-Zor against the Islamic State, do not openly assert links with Hezbollah but at least reflect ‘Syrian Hezbollah’ as a brand. Much more obscure, however, are Syrian militias openly claiming a direct affiliation with Iran’s Islamic Revolutionary Guard Corps (IRGC). Liwa al-Mukhtar al-Thiqfi (“The Mukhtar Thiqfi Brigade”) is one such group. The name al-Mukhtar al-Thiqfi is derived from a person by the same name, who led a revolt against the Umayyads in an attempt to avenge the death of Imam al-Hussein, the grandson of the Prophet Muhammad killed at the Battle of Karbala. 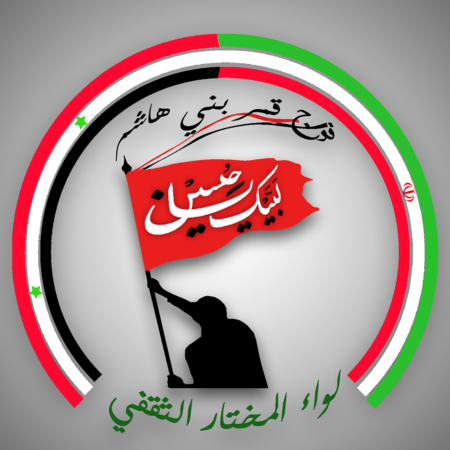 The name Fawj Qamr Bani Hashim (“The Moon of Banu Hashim Regiment”) featured on the militia’s emblem is just an alternative name for the group. One should compare with additional use of the names Kata’ib al-Imam Ali (“The Imam Ali Battalions”) and Fawj al-Nabi al-Akram (“The Most Noble Prophet Regiment”) by the Syrian Hezbollah group Liwa al-Imam al-Mahdi. The “Moon of Banu Hashim” refers to Abu al-Fadl al-Abbas, the son of Imam Ali, who was the first Shi’i Imam. Abu al-Fadl al-Abbas was also killed at the Battle of Karbala. Another photo featuring al-Hajj Mukhtar. In addition, al-Hajj Mukhtar stressed that the militia’s members are only Syrians, trying to highlight a supposed multi-sectarian composition: “Syrians from the Shi’i sect and the Sunni and Alawite sects. Iraqis are present but not in the brigade with us.” Of course, it is not entirely impossible that Liwa al-Mukhtar al-Thiqfi has members of other sects, who may adopt the group’s Shi’i slogans, banners and may even participate in some Shi’i traditions without formal affiliation/conversion. 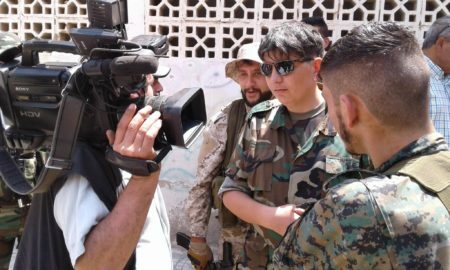 Like many other militias trying to deal with manpower problems on the regime side caused by desertion and draft avoidance for service in the Syrian army, Liwa al-Mukhtar al-Thiqfi has offered taswiyat al-wad‘ (“sorting out of affairs”) for some military personnel in a bid to recruit members. As al-Hajj Mukhtar explained: “Taswiya for military personnel only, meaning for misdemeanours, meaning the soldier delaying over his duty hours, and the soldier refraining from obligatory service: i.e. simple matters only.” The salary offered for members amounts to 57,000 Syrian pounds per month, which is equivalent to slightly more than $100 per month. In total, al-Hajj Mukhtar claimed that there are approximately 4500 fighters in his formation, though such a number is likely an exaggeration. As far as ‘martyrs’ go, he claims only 14 ‘martyrs’ in number till now. At least one of these ‘martyrs’ can be identified using publicly available information, as per below. Badi’ Muhammad Hasawi, said to have been from the Hama town of Morek by origin. He was announced to have been killed fighting on the Latakia countryside front at the end of November 2016. Hasawi’s death provides some further insight into the composition of Liwa al-Mukhtar al-Thiqfi. It seems an entire contingent of the militia originally comes from Morek. Some more photos from those involved in the militia are provided below. 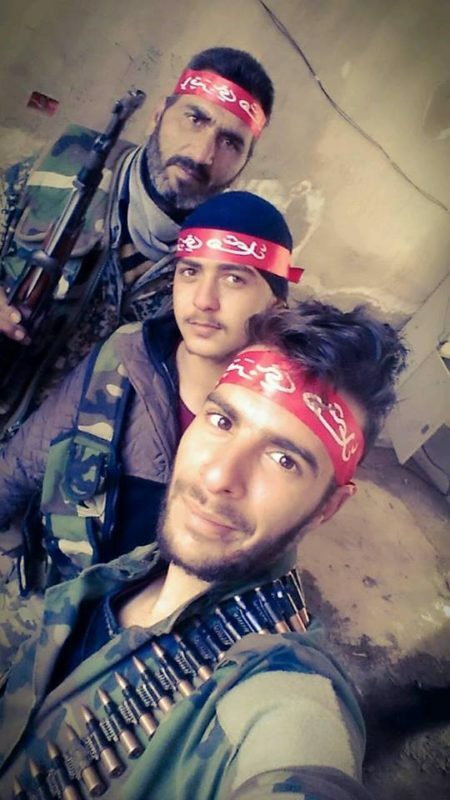 Members of Liwa al-Mukhtar al-Thiqfi, wearing headbands with the inscription “Ya Qamr Bani Hashim” (cf. here). 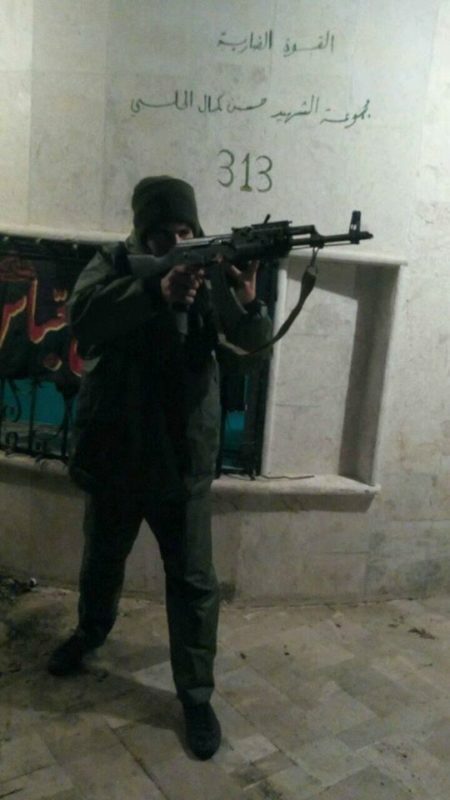 A member of Liwa al-Mukhtar al-Thiqfi with 313 insignia. The number 313 has been used in reference to this group as Fawj Qamr Bani Hashim. For the significance of 313, see this article I wrote on Saraya al-Areen. Wall graffiti: “The strike force. The martyr Hassan Kamal al-Halabi group: 313.” Hassan Kamal al-Halabi, who was killed in a bombing in Homs in February 2016, is commemorated by Liwa al-Mukhtar al-Thiqfi. 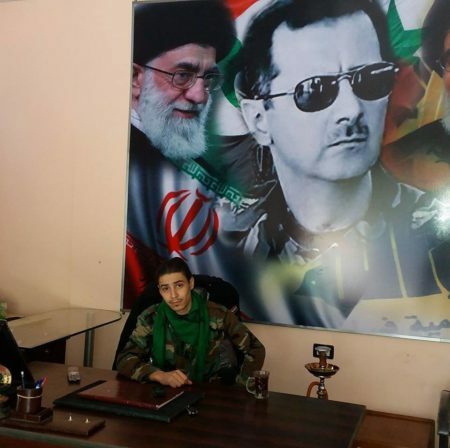 Member of Liwa al-Mukhtar al-Thiqfi in front of a poster featuring Bashar al-Assad, Iran’s Supreme Leader Ayatollah Khamene’i, and Hezbollah leader Hassan Nasrallah. Overall, Liwa al-Mukhtar al-Thiqfi is a rather small formation, but the group is an interesting case of a Syrian militia presenting itself as directly affiliated with the IRGC, rather than simply ‘Hezbollah in Syria’ or ‘Syrian Hezbollah’. It will be interesting to see if other militias along these lines emerge in the future. (Update 9 March 2017): A reader inquired as to the death of Badi’ Muhammad Hasawi and the attribution to him of a military rank in a tweet from the time of the announcement of his death. There is in fact no inherent contradiction between that attribution and membership of Liwa al-Mukhtar al-Thiqfi. It is rather a case-in-point of multiple affiliations and evolution in roles over time. 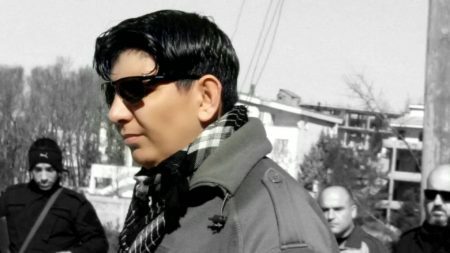 Primary source posts in Arabic on social media point to Hasawi’s position within the Hama military intelligence (al-amn al-askari) and that he had led his own fighting contingents in Hama province. Such a record would undoubtedly serve as a basis for a military command role in Liwa al-Mukhtar al-Thiqfi. 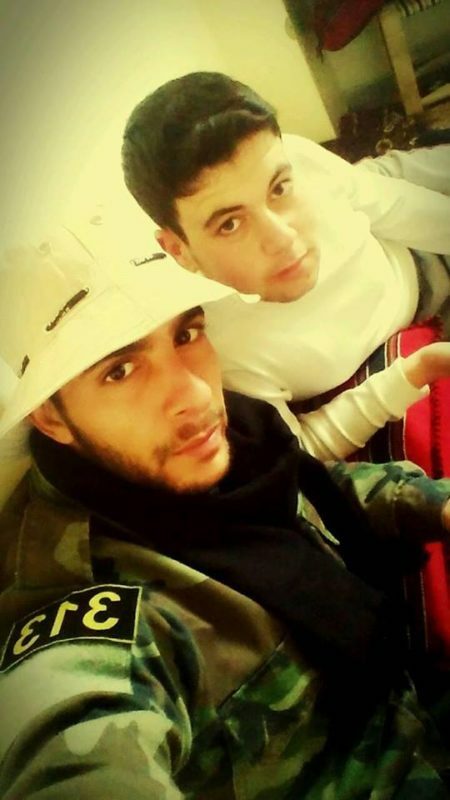 For comparison, note the post from November 2016 linked to in the main article that attributes to him a military rank- naqib– and says that he is the leader of the group’s military operations in the Latakia countryside. 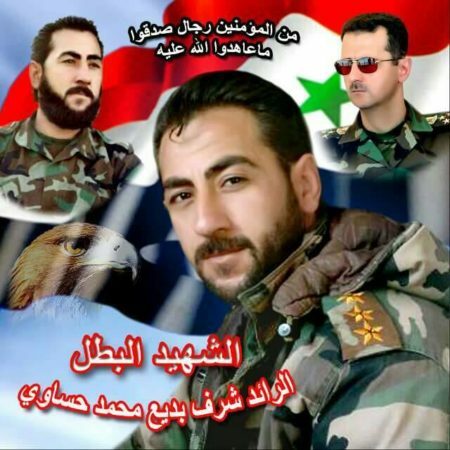 New Assadist narrative: the war’s over, nothing left to see here. Aim is to convince an erratic admin to cede all to Iran, Russia, regime. @N_Henin Correct. It’s over because we need you to believe that. Yes, Alqaeda.3 aka Hay’at Tahrir alsham is the largest fighting force on the rebel side and was just declared a terrorist group by the state dept. you can not make chicken soup out of chicken poop, and when your friend is a terrorist it does not matter who your enemy is !! The only thing that ” Islam is the solution” banner holders brought to Syria and the Middle East is terrorism and destruction that is why they are allied with Israel and Saudi Arabia.